We may not know always when God may use us, we just move when he says to, and He will move. I received this Encouraging email from a wonderful believer from the USA. God Bless, Laurence. As I was taking out my trash, I met this young man from Puerto Rico, whom lives at my apartment complex. His English was not very good, so I spoke to him with my limited Spanish. 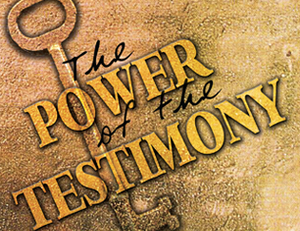 After a short time, the things of God got into the conversation, and I shared with him some of the great testimonies that God had done by my ministering, as well as others. This man mentioned to me how he had this dream about Jesus, when he was sixteen years old, and how he told all his friends at school about this, and shortly thereafter had manifested SITs and Prophesy at this Pentecostal Church in Puerto Rico. The man then told me how he had not been walking with God as he did when he was younger, and he pointed to a few tattoos he had put on since then, and believed that he would need to remove them to serve God again. God told me to immediately turned on my computer and went to your video teaching on Expectation from God, where you had on the black tee shirt with Jesus Christ in white letters on the front, and your arms were exposed, showing your tattoos. He was amazed, and greatly encouraged, and was excited that God was still working with him. Even though his English was limited, he knew you were speaking the Words of God. We may not know always when God may use us, we just move when he says to, and he will move. Your fellow labourer in Christ Jesus. That is so wonderful! How beautiful that someone could be shown that it’s not about what’s on the outside of our bodies but what’s on the inside of our bodies that matters. For man looks at the outward appearance but God looks at the heart! yeah! Thanks God for that! How sweet and fantastic that is! God will Truly use all means necessary to show His undying and everlasting love to people whoever they are and wherever they are from.